See a full page Ad example here, for less than 6 € a week! You can see the clients own website here. Her advertisement sends readers to her site. Notice the references in the bottom right hand corner. "& advertised in the Search Spain in English Portal of the Independent-spanish-property-guide.com"
If you do not have a website then a webpage advertisement is all you need. See this example of an Interior Designer without a website. (She actually paid 1500 € to a webdesigner for a website, but never got more than a homepage! You get your own personalized domain name and email address, text and images about your company, contact form and interactive map of your location. Our Interior designer's company is called 'Strawberry Design Inc.', so her personalized domain name is: www.StrawberryDesignInc.SearchSpainInEnglish.com and it redirects straight to her advertisement webpage. As well as all that you also get a contact form on your site. The reason being is that it is unadvisable to include an email address on a website because there are machines out there looking for email addresses. Once they find yours - your inbox will be flooded with spam. The email we give you has the option to 'whitelist' clients and directly eliminate SPAM messages. Your emails can be read directly from your Mail box on your computer, or it can be used as a 'hotmail/webmail' account and be viewed from any computer online. Benefit from having your online advertisement within a mature, highly visited site (The new 'Search Spain in English' Portal is on the Independent-spanish-property-guide.com) for just 299 € a year. We guarantee you will be found! Because your new webpage advertisement is placed on a mature, popular website. The major search engines such as Google, Yahoo and MSN index or visit us regularly, looking for new articles to include in their directory. This is why your company's webpage advertisement will be visited. There is nothing worse than paying a 1500 €uros (the average cost for a full non optimized site) like Katie did from 'Strawberry Design Inc.' than having a spanking new site that nobody can find! If you can afford an optimized website (the starting price is 7000 €) you cannot guarantee visitors either. You can pay a small fortune for an optimized website, but unless you constantly update the content or pay a full time optimizer to keep you in the Top 10 you will receive hardly any visitors. A friend of mine receives only 2 unique (new) visitors a day after a year online because there's no way she can employ a full time optimizer just for her site. When she complained to the company about lack of visibility, they asked for more money to add content! By forming part of a mature site who do have full time web optimizers you can be confident that you will get a Top position for your company name, resulting in more clients and more sales for a minimal price. Google can take up to a year and a half to visit a new site. That means that unless a client of yours opens a new browser window and types in "www.yourcompanyname.com" they will not be able to find you. Ask Tom from 'www.Distant-Healing-Online.com He had had his site up over a year and still his clients couldn't find him. After advertising he was 'indexed' (meaning included in the Google Directory) after just two days! He certainly knows the difference between an optimized or a non-optimized web presence. Most surfers just open Google or Yahoo and type yourcompany.com into the little box. Google then tells them your site does not exist although you know it does, because it hasn't been indexed or included in the directory yet! You then have to phone the client and explain to them that it is a new site, hasn't been indexed yet, so if you go to start, run and type www.mycompany.com it will appear! With 'Search Spain in English', we guarantee results. If your company name is not indexed with either Google, MSN (now Live.com) or Yahoo within the first year, you will receive a free years advertising the following year. You may also keep your personalized domain and email accounts. Your advertisement or company portfolio is live 24 hours a day, 7 days a week, 365 days a year, for a tiny part of the price that you would pay for a lineage ad in the best local newspaper, or a miniature box in the yellow pages, but with lots more details, photographs, and company information that would never fit into a tiny 3cm square. It is rather small to see, but you can do the test yourself. 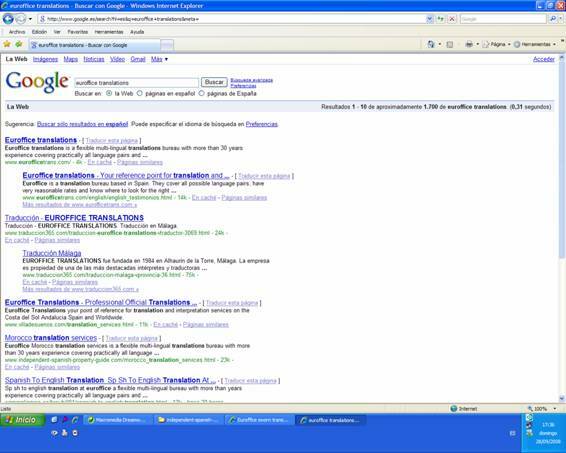 Go to www.google.com and type in euroffice translations. You will see that she is number one out ot 1700 results. Here's an enlargement of the above. 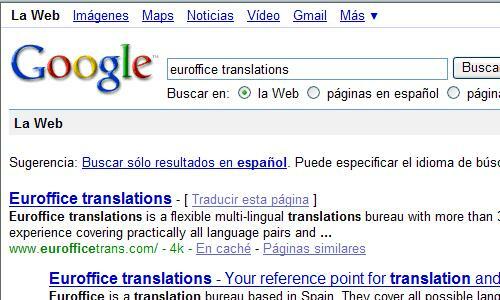 A typical client looking for you would just type Euroffice translations into Google. If you have not submiitted your webpage with the correct metatags to the search engines, they don't know that you exist. Google/Yahoo/MSN are constantly 'spidering' the web looking for new sites, so why not make their job easier by saying ' Here's my site and it's about ***". * If Paypal comes up in Spanish, it is because it knows your computer is in Spain and presumes you are Spanish speaking. In the top right-hand corner, you have the option to change the language to English. *You do not need to have a paypal account in order to pay for your advertisement. You can use your credit/debit card directly. You can find this option just below the paypal login box on next page. *You can also use your Money Bookers Account.